Kitronik Klip Halo kortilla saat BBC microbit kaikki pinnit käyttöösi. Helppo käyttää krokoklipseillä tai E-tekstiili projekteissa. The Klip Halo for the BBC microbit breaks out all of the pins from the microbit to pads spaced around the edge of the Klip Halo. The pads have been carefully designed and spaced so that they are ideal for for use with E-Textiles projects and also for projects that require the use of Crocodile Leads. 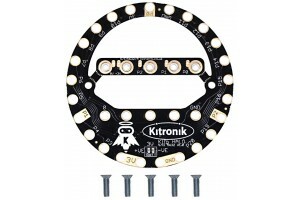 When a micro:bit is connected to the Klip Halo, power can be supplied in multiple ways. These are via the USB connector on the micro:bit, the JST connector on the micro:bit or Klip Halo, or using the power rings on the Klip Halo. Depending on which option is used effects the maximum and minimum voltage that can be used and the amount of current that can be drawn from the rings on the Klip Halo. For more details and powering safety information, see the power information and safety datasheet for more information.